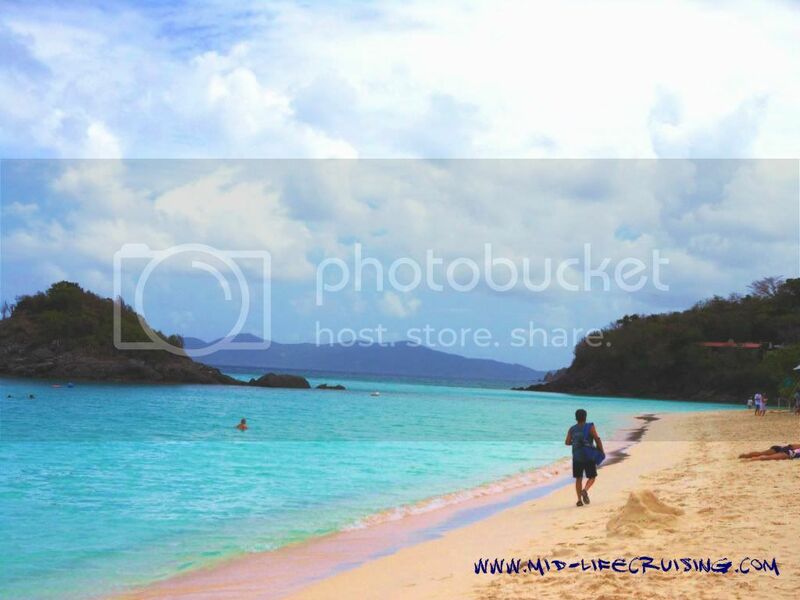 That's Ken standing on the beach of Trunk Bay with our snorkel gear! 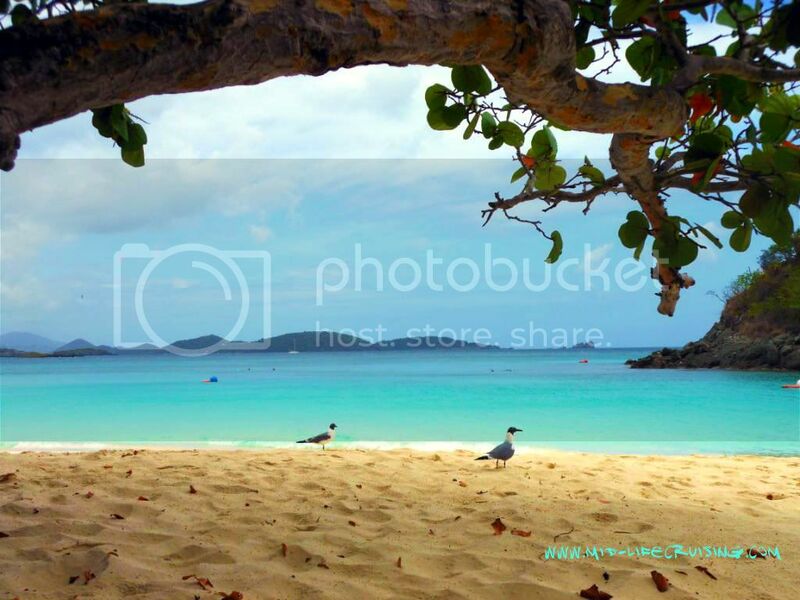 After a great day on the island of St. John, we decided to head there again the next day. 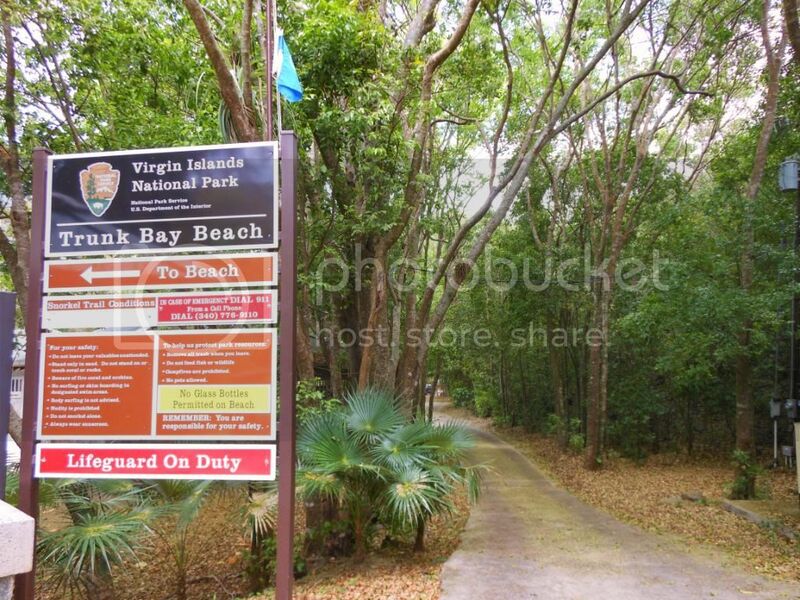 With the majority of the island being a national park, there was so much we wanted to see. Unfortunately, we only had a couple of days left of our vacation so we had to choose from so many beautiful places on the island. 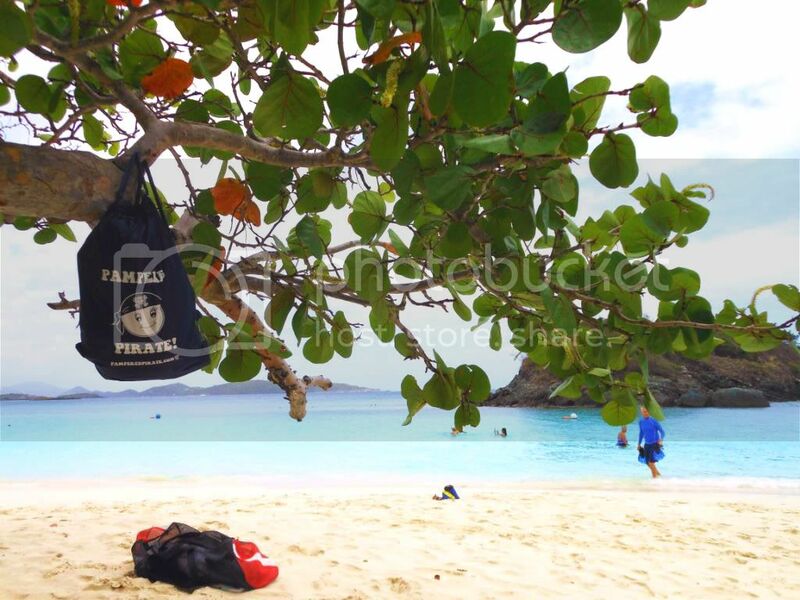 Since we love to snorkel, we chose to spend the day at Trunk Bay, which is known for its underwater snorkel trail. After breakfast at the resort, we were once again on the ferry in Red Hook. Again, we were treated to a beautiful ride from St. Thomas to St. John. 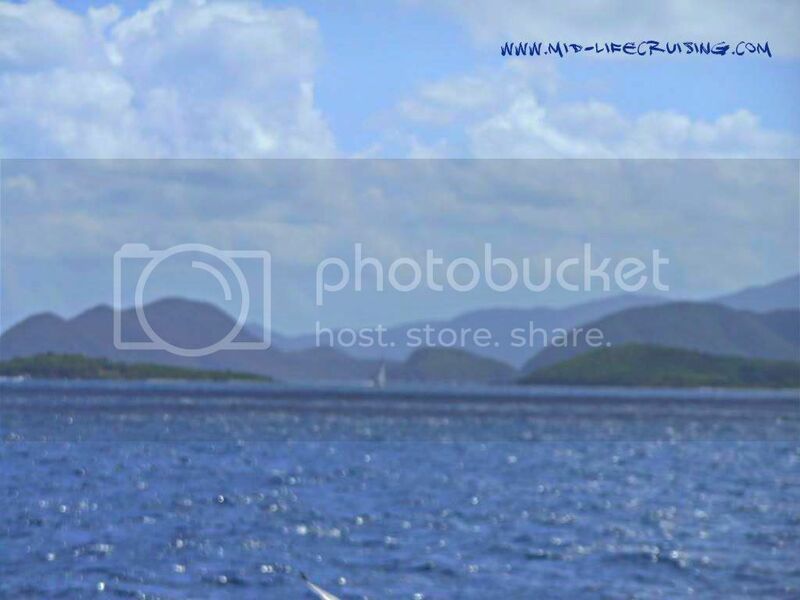 The first picture below is a little blurry, but it gives an idea of all the beautiful islands so close to each other. 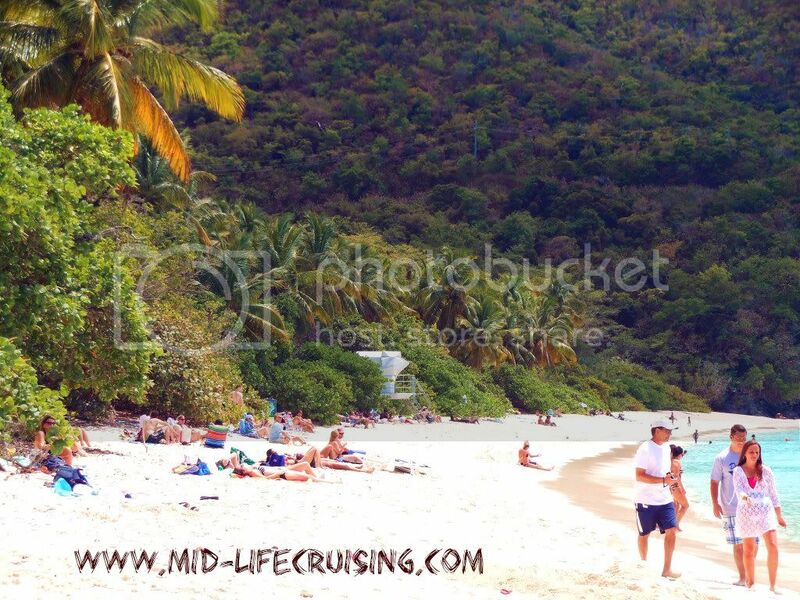 After the ferry ride to St. John, we quickly found an open-air taxi and were on our way to Trunk Bay. 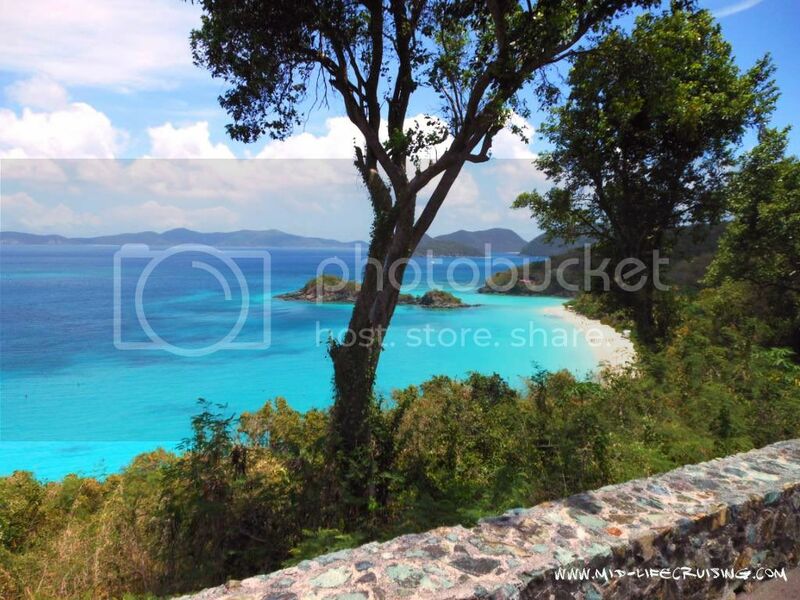 Again, the views from the hillside were amazing and I snapped the picture of Trunk Bay from the taxi. Minutes later we were at Trunk Bay, which is a part of the National Park. As luck would have it, we didn't have to pay the $4 per person entrance fee because all national parks were waiving their fees for the weekend. 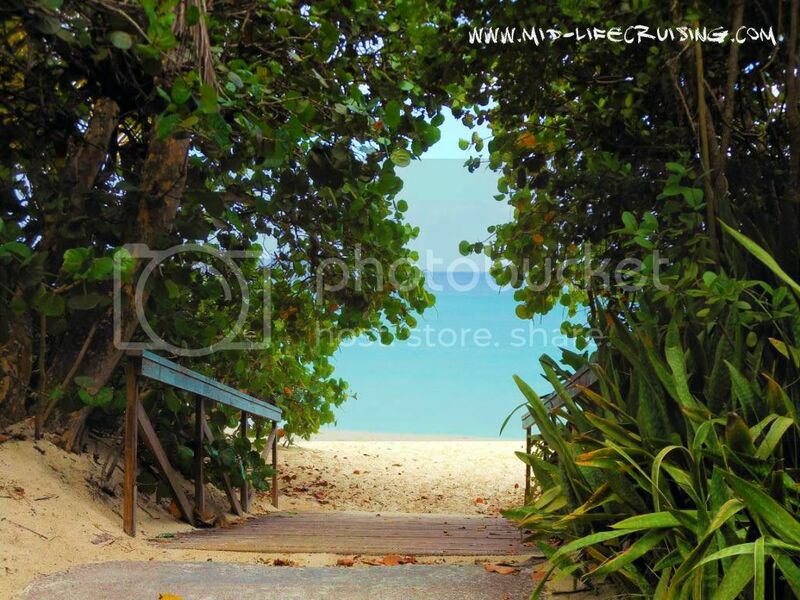 The wooded walkway had several entrances to the beach, just welcoming you to come in! The beach was beautiful, but I don't think you'd find an unattractive beach on these islands! 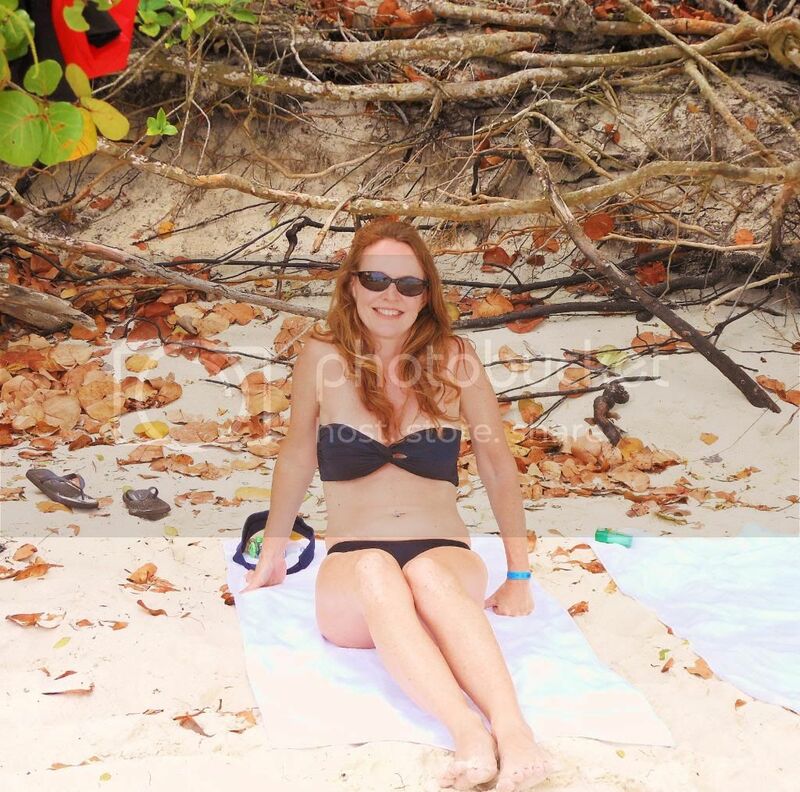 Like Cinnamon Bay, this beach also had lots of natural shade underneath the bushes, where we grabbed our spot. 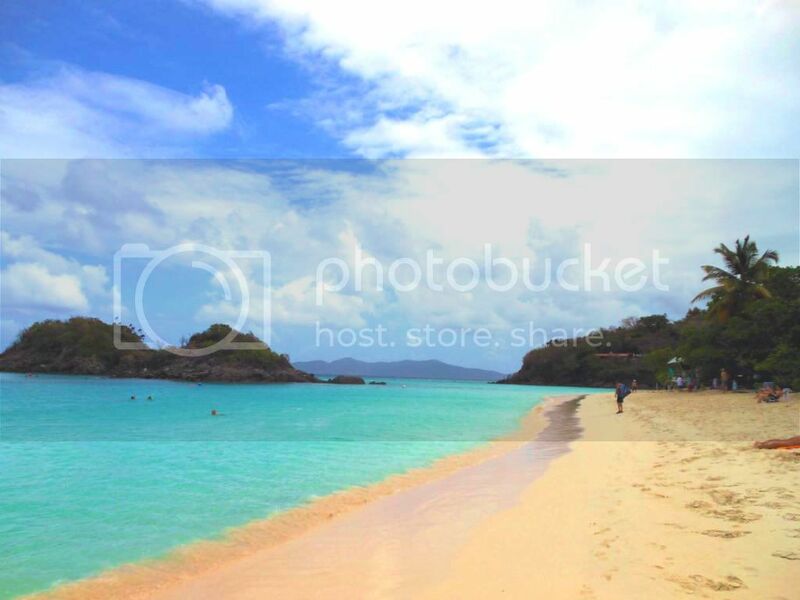 After snorkeling the underwater trail, we kicked back on the beach for a while and enjoyed the views! 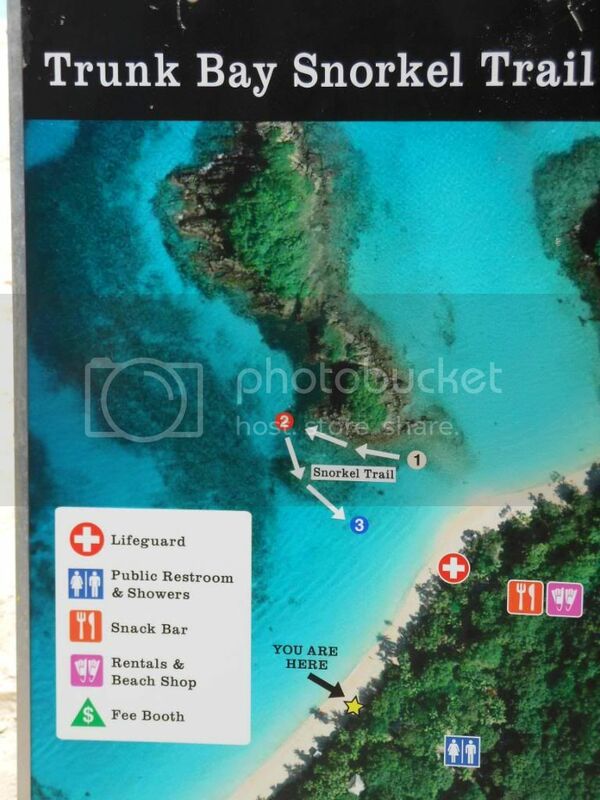 To be honest, we loved the beach of Trunk Bay but the snorkeling wasn't the best. The water was clear and beautiful, but this particular day didn't provide very many fish. However, it was still a great time. When we were ready to head back to town and catch the ferry, we took advantage of the clean showers and changed clothes. 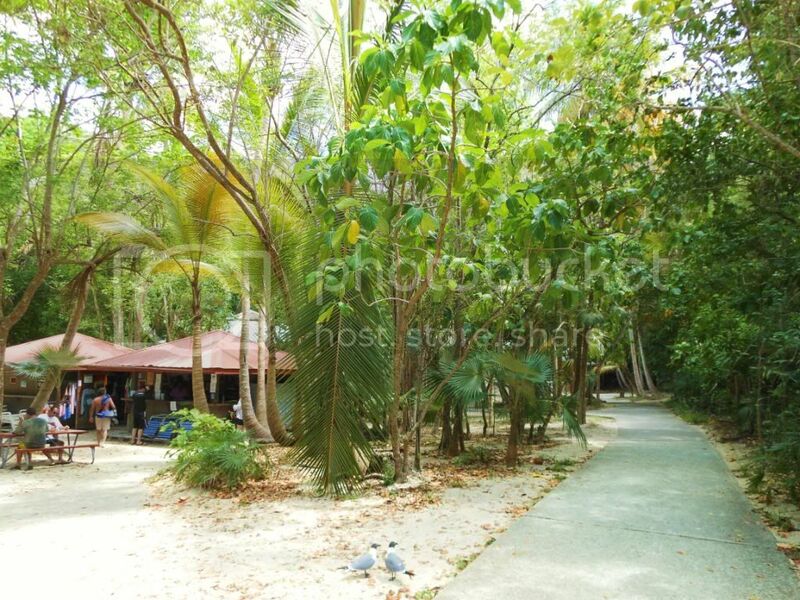 We also noticed that there were camp sites along the path for rent ... what a cool place this would be to camp! 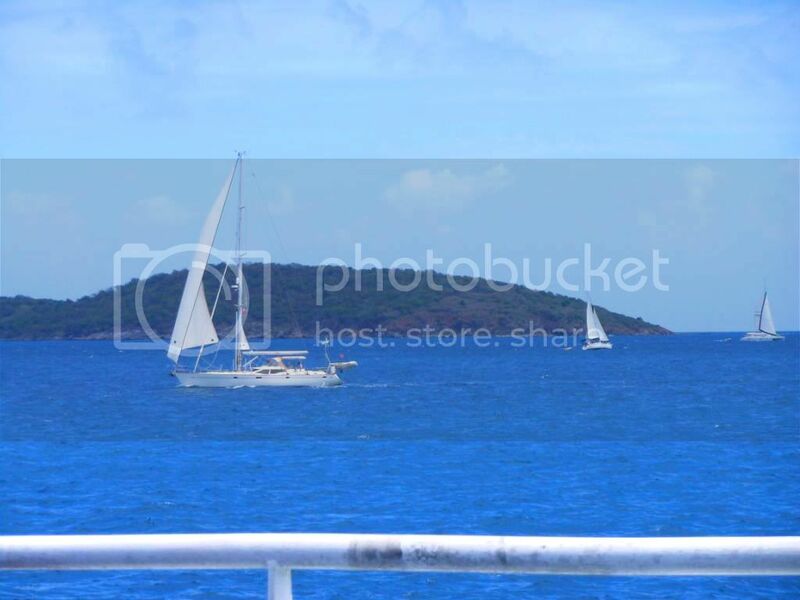 We grabbed the ferry back to St. Thomas, and once again were treated to beautiful sights. 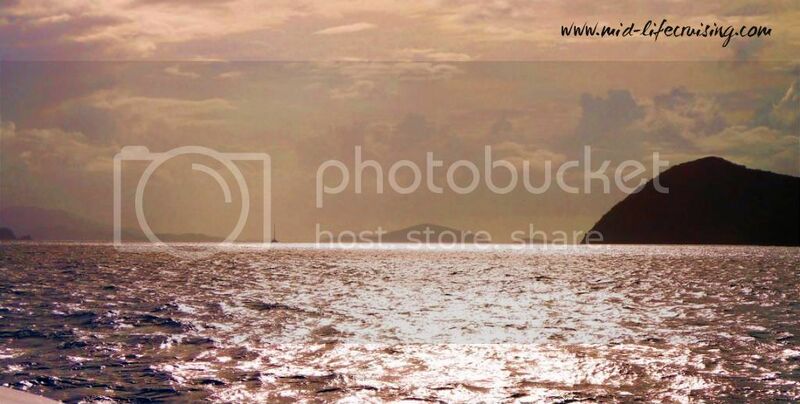 If you look towards the center of the picture below you'll see a sailboat on the horizon among the islands ... love it! 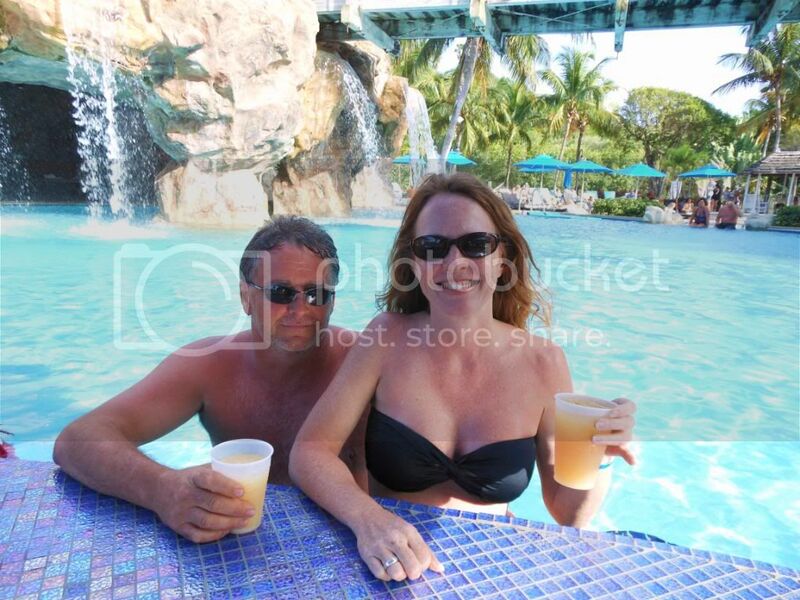 We arrived back to the Sugar Bay Resort in time for a few evening cocktails at the pool bar. That drink in my hand was a "Moonlight Sail", which was full of alcohol (will post recipe soon) but tricked me with its innocent taste. Let's just say that after two of these drinks on an empty stomach ... I had to ask Ken what we ate for dinner! Ahhh ... good times! 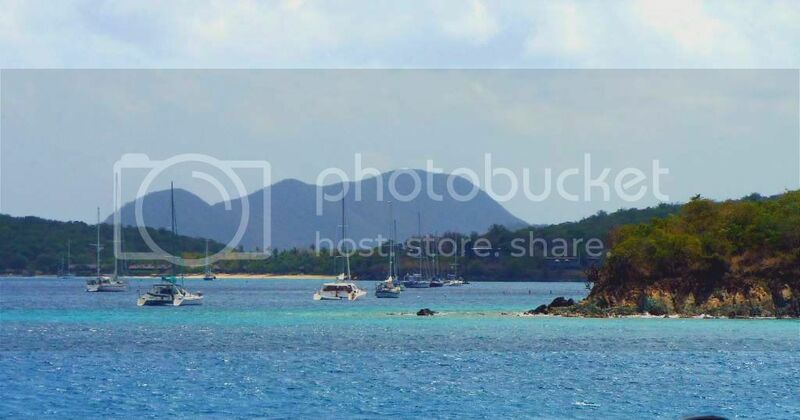 I'm such a lightweight, but luckily I passed out before 9pm so I was feeling fine early the next morning for our 8am ferry ride (only runs once a day) to Jost Van Dyke in the British Virgin Islands. Thank goodness for alarms ... the only time we used one the entire vacation. Thanks to Ken as well for setting it ... he knew there was no way I had! Ken said that after dinner I kept trying to get him to go to the resort's casino and play blackjack with me. Luckily, he got me to our hotel room instead because the next day was another great one. 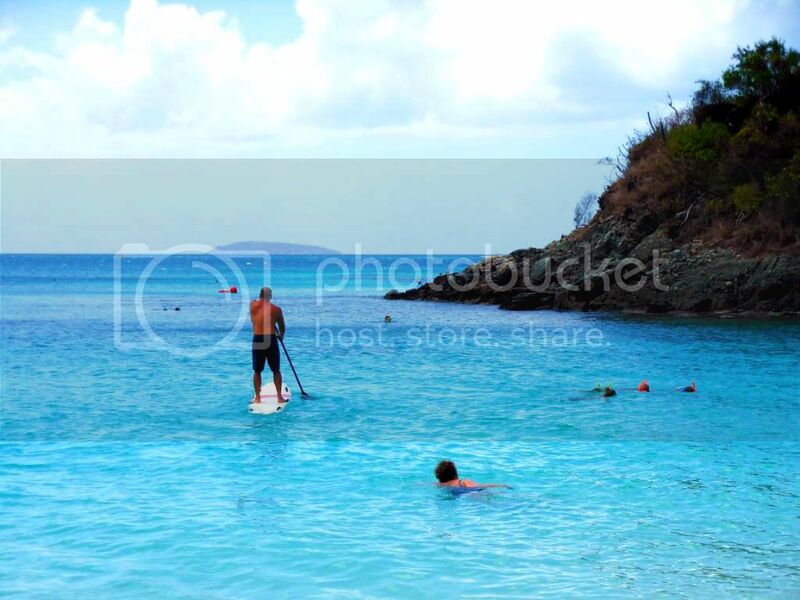 More to come about Jost Van Dyke and two of its famous bars ... Foxy's and the Soggy Dollar! I know I just got back from our vacation, but I could sure use a vacation like the one you took. Just saying. Beautiful. I think I want to get married out there...Time to hint that to the boyfriend! hehe ;) So happy you two had an amazing trip. The photos just keep getting better and better - stunning!! 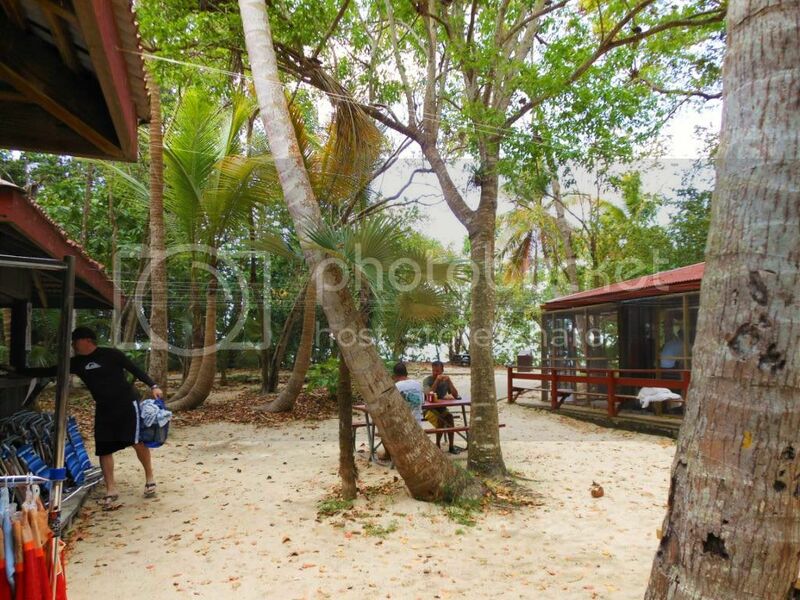 We've been to Foxys and The Soggy Dollar and we're looking forward to your report. What a super fun time you guys are having!! The pictures are beautiful. Don't you wish you had your sailboat down there? And, why don't you? 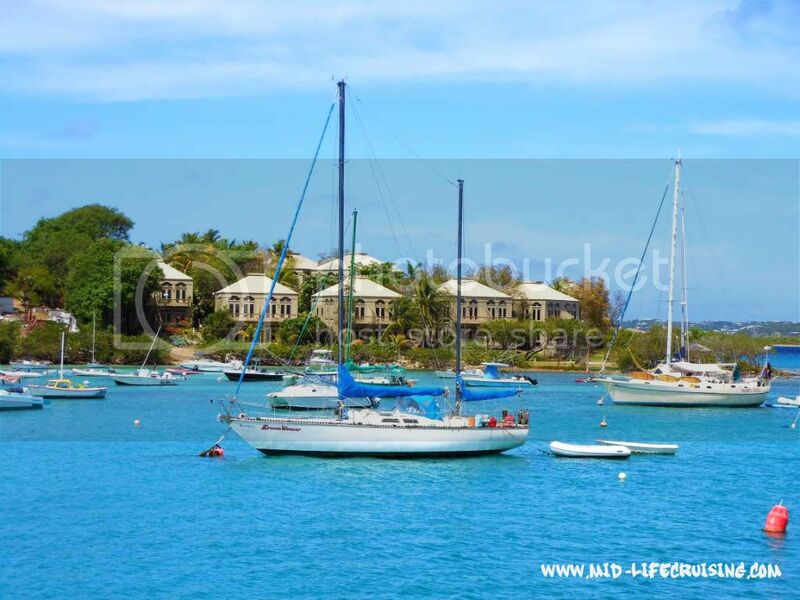 We hope to get a sailboat in a few years and sail those islands...we love the BVI and especially White Bay and Soggy Dollar Bar! 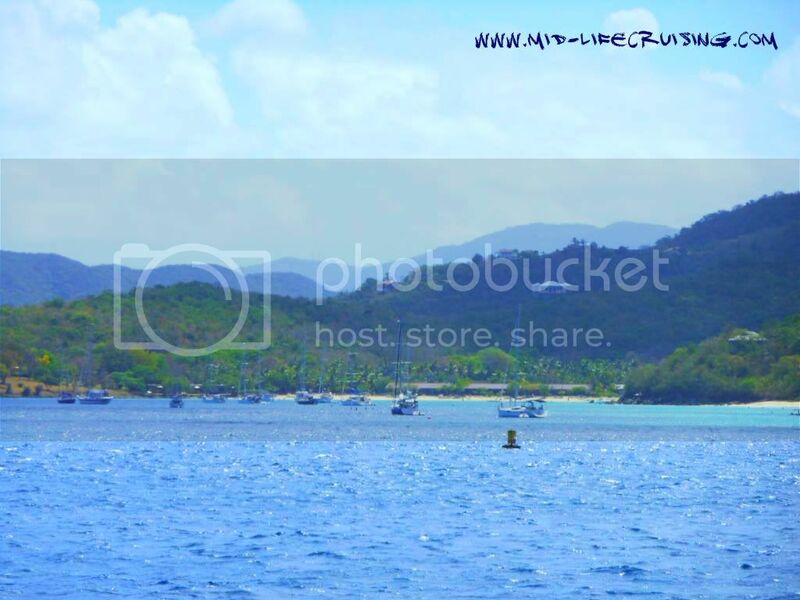 Can't wait to hear about tomorrow's adventures at Jost Van Dyke! 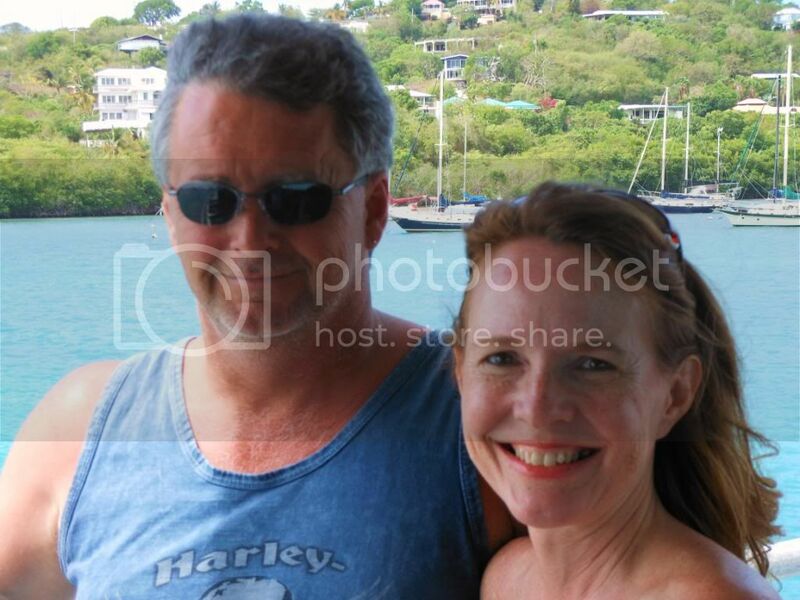 Cathy, we saw several wedding while in the Virgin Islands ... what a beautiful place to get married! Terry, we do have the sailboat and we did miss it on this trip! However, the goal is to get her down there ... that's what this blog is all about so keep reading!